Extension methods are methods that you can add to instances without necessarily having access to the class source. Linq methods were implemented as Extension Methods. This is really useful when you need to apply some common complex action on top of some object. I personally think you should replace any Util class you might have to extension methods, it looks more semantically correct. 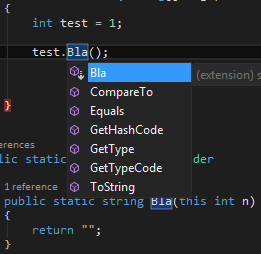 This entry was posted in General and tagged c#, extension-methods on March 8, 2015 by BrunoLM.